Kids are not easy companions to travel with as they cannot stick on to the same place for long. Your trip becomes more tiresome when your flight is delayed or you’re stuck in transit for long hours. However, various international airports of the world have come up with play areas and nursery services to restaurants with a lot of kid activity to keep them involved. We have therefore, come up with a list of the top 10 child friendly airports around the world where if you have a cancelled flight, you won’t have to pull your hair off. Have a look! Smiggle Store in the Gold Coast Airport in Australia is a big advantage for parents travelling with kids. The stationary store has enough amenities from coloring to drawing to keep your kids entertained. The Jet Star Lounge available to Jet Star passengers offers complimentary food and beverages to children. The lounge also has a mini kids’ cinema within the play area itself. The bathrooms within the airport also have parent’s room. You can purchase snacks and beverages for your kids for the several stores present. You can pre-purchase the Gold Coast Lounge on Jetstar.com. They have a call centre +131 538 where you can make the booking. You may also book for the entrance on the day of travel itself. Munich Airport is one of the kid friendly airports in Germany. They have various entertaining facilities for young passengers like Kinderterminals. They also have child-friendly touch screen monitors for kids to make them understand the functioning of the airport. Just right below the observation hill, there is an airplane for kids to play in. Other smaller play areas are located in Departure and Arrival Gates B and C, Departure C and Arrival D, Arrival Terminal 2, Departures Terminal 2 (behind security check). However, entry to the play area is free. Edinburgh Airport is one of the best airports you won’t mind being stuck with your kids. It offers excellent childcare and entertainment facilities for toddlers and teenagers alike. They have something or the other to do for every age group. The play area known as Fingerbox is located near Gates 2, 4, 9 and 11. The first floor near the Food Village is the most entertaining section of all. The restaurants also offer special menus and high chairs for kids. And if you are travelling with a newborn, there are baby changing facilities all over the airport building. However, entry to the Fingerbox is free. Amsterdam Airport Schiphol is another convenient kid friendly airport. The play area is known as the Kids’ Forest and is abundant in climbing structures, Lego and Nintendo computers. 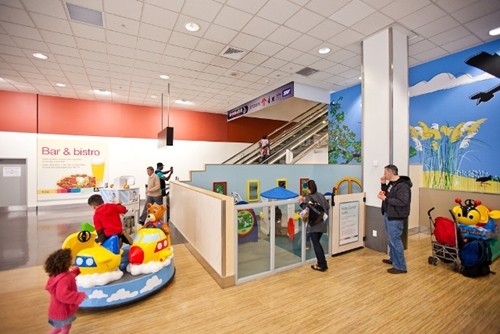 They also have baby care facilities and with changing areas and cribs between Departure Lounge E and F. McDonald is also present at the top level of Gate F. The Panorama Terrace between Departure Gates 1 and 2 will be an ideal visit if you are travelling with older kids. The third floor houses the Astro-Jet Flight Simulator that provides great views of the air field. However, entry to the Kids’ Forest is free. The Panorama Terrace remains open from 9am to 5pm during winters and 7am to 8pm during summers. Barajas International Airport is ranked as the best free play areas in Europe. A play area has a tube slide and jungle gym located at Terminal 2. They are also let to play with tricycles and ball-pit. If your kid belongs to the quieter category, there are many creative activities to keep them occupied too. The Terminal 2 also has nursery services and also let you heat their food, change nappies, bathe them and even put them down for a nap for that matter. However, entry to the play area is free and remains open from 8am to 8pm. Hong Kong Airport has the largest 4D screen in Asia. The recreation area known as I-Sports is perfect for your little sports lovers where they can play football, basketball, golf, car racing and more with the help of simulators. The play area is located at Terminal 1 on level six, between Gates 23 and 25. It has a total of four television lounges and a number of games to keep your kids engaged. The Dream Come True Education Park present at level six is a unique liberal studies platform that lets you kid experience real life dreams with role-playing uniforms. Cash Coupons are available at the Airport which can be used for all Sky Plaza entertainment services. Dream Come True Park timings: 9.30am to 6.30pm from Monday to Friday and 9am to 8pm on Saturday, Sunday and Public Holidays. Changi Airport has the longest slide for kids in the whole of Singapore. The slide located at Terminal 3 is four storeys tall and is quite popular among the kids. They are also a lot other play area across the airport building. There is a Zone X present at the Terminal 3 and Basement two of the airport. They also house an indoor playground known as SingKids Playsystem on the same level. The Canopy Playground at Terminal 1, level three is another indoor play area located near the viewing mall. Canopy Playground Timings: 10.30am to 10.30pm daily. They charge Rs 262 for 30 minutes of playtime. For Zone X the Timings: 10.30am to10.30pm from Monday to Thursday, 10.30am to 11pm on Friday and 10am to 11pm on Saturday and Sunday. The play area at the Abu Dhabi Airport is open 24×7. They have appointed experienced female staff members to help you breathe easy as your kids run, play and jump around in a safe environment. They also offer drawing materials, internet access, bicycles and Mega Touch computer games. There is also a nursery within the play area in case you need to change or feed your baby. It is located at Terminal 3, adjacent to Gate 32. The Plaza Premium Lounge is a private lounge to entertain your kids for long hours. It also provides 48 free high-speed internet ports. Snacks and drinks are available along with access to televisions, online gaming and magazines. Additional shower and nap areas for the younger kids are also available. The airport also houses restaurants and arcade games for kids. However, children above six are charged on a per day basis. Kids on the Fly is the playground designed by the Chicago Children’s Museum at the Chicago O’Hare International Airport. The area is aviation-themed that houses an interactive cargo plane, a helicopter, a luggage station and an air traffic control tower to give your children an insight about the workings of the airport. If your kid is not a big fan of airplanes, there are a lot other entertainment to indulge your kid in, for example, the Legos. They have a special play area for kids with disabilities at Terminal 1, near Gate F1. However, entry to Kids on the Fly area is free.